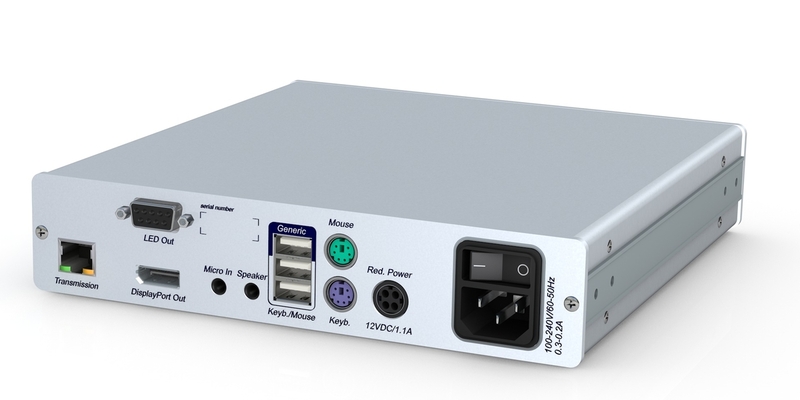 The G&D DP-HR-CON Fibre (S) MC2 - User Interface Module connects to your User Station via DisplayPort single Link (1920x1200) or Dual Link 2560x1600, PS/2, USB & audio cables, it then extends the User Station to the G&D KVM switch via either Multi-Mode (400 meters) or Single Mode (up to 10,000 meters) Fiber Optic cables. Console modules are used to connect workplaces with the system. Optical fibres connect the console modules to the central module and provide the required interfaces for peripherals (monitor, keyboard, mouse, speakers/microphone). DP-HR components let you integrate graphics cards and monitors with DisplayPort™ connectors at high resolutions into digital matrix systems. A bandwidth up to 300 Mpixels/s allows resolutions up to 2560x1600 / 60Hz. The transmission takes place via CAT cables or optical fibers (only for ControlCenter range) thus allowing transmission distances of up to 10,000 m.